Carrot and Peanuts combine in this free recipe to form a simply made but delicious combination that can be served either as a side dish, salad, starter or just as a relish to enjoy with poppadums. It can be made in advance and stored in the fridge for up to two days. Serve fresh and warm or cold. It is not intended to be stored for extended periods. The version with desiccated coconut included has a richer, slightly sweeter flavour. Please note that this recipe contains nuts. 1lb (450g) carrots shredded or grated fairly finely. 3oz (80g) roasted, shelled peanuts. 2 medium sized fresh (or recently defrosted frozen) whole green chillies. 2 tablespoons of vegetable oil, sunflower or peanut or a mixture of both are OK.
Optionally 3oz (80g) fresh desiccated coconut or fresh grated coconut. Prepare all the ingredients above. Grind the peanuts in a coffee or other grinder fairly coarsely until you have grains about 1/10" (2mm) in size. They could be chopped to this size if preferred. Put the carrot, coconut if used and most of the peanuts into a bowl and mix thoroughly. 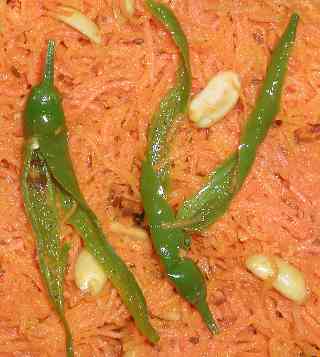 Combine the lime juice, sugar and salt in a dish and pour over the grated carrot. Cut the chillies in half lengthwise leaving the stalk intact. De-seed if you prefer a milder flavour. This is best done by sliding the back of a knife down inside each side to remove the seeds. Heat the oil in a small pan until fairly hot (no smoke please) and add the cumin seeds. Quickly stir, add the chillies, stir again and then pour over the carrot mixture. Mix all together, if possible leaving the chillies on top. Sprinkle the remaining peanuts over all to garnish. As we said, this dish can be served straight away or left to cool and served cold or kept in the fridge for up to 2 days but is best not re-heated.